I am going to preface this review with the fact that I, perhaps unfairly, have high expectations for this tea. I love s’mores. I love camping, and roasting marshmallows, and the ooey-gooey marshmallows with graham crackers and slightly melted chocolate. The smell of the dry tea is interesting – the only smells that I can pick out are chocolate and cinnamon, with perhaps a touch of vanilla. There’s a whole host of other ingredients that I’m not getting. Teavana recommends steeping S’mores Oolong in 195°F (91°C) water for 3 minutes. I steeped mine for 3 minutes. When S’mores Oolong is steeping, it has a heavy chicory root and cinnamon smell, surprisingly I can’t make out the chocolate at all. 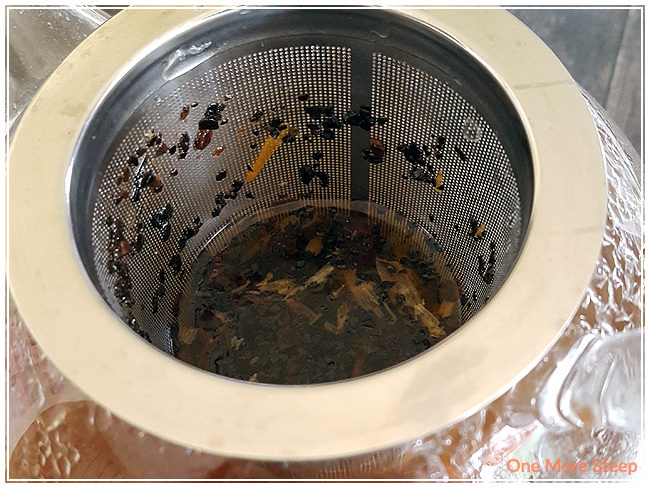 I would recommend that you use a filter bag instead of a stainless steel filter basket, unless the mesh of your basket is very fine – I wound up with a lot of small bits in my tea. The tea is quite cloudy, and smells strongly of chicory root and cinnamon, it smells sweet and has an oily film from the melted chocolate floating on the top. S’mores Oolong smells of cinnamon and chicory. It’s a cup of watery cinnamon and chicory root, with a little taste of chocolate, but it isn’t overwhelming in terms of flavour. There’s a bit of sweetness (from either the chocolate or the marshmallows), but I can’t taste either base (oolong or maté). It doesn’t taste very good to the point where I did not finish my cup because it just does not taste good (or taste like any kind of tea or beverage that I’d want to finish). I looked into the steeping basket after I had poured out a cup and realized that there was actually very little tea in the tea itself – the majority of what was left was just all the ingredients that show up before the oolong (aside from the marshmallow, that melted away). I did not steep S’mores Oolong a second time. 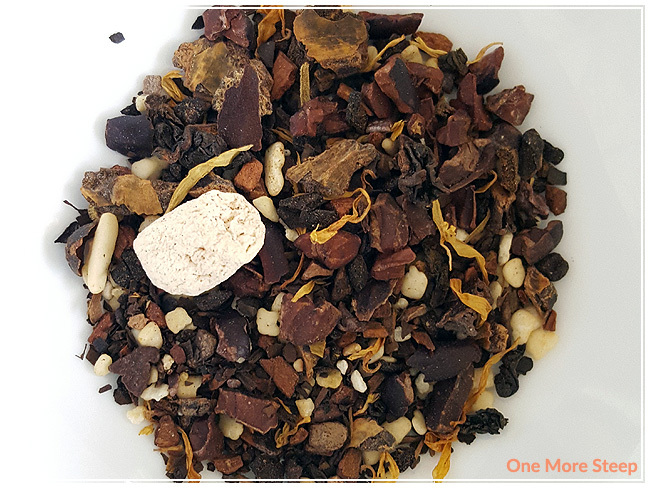 I didn’t like Teavana’s S’mores Oolong Tea. It does not remind me of s’mores at all, the chocolate doesn’t come out as strongly as I expected from the dry tea. The overall flavour is underwhelming because the chicory root and cinnamon are strong and I can’t taste the base at all. 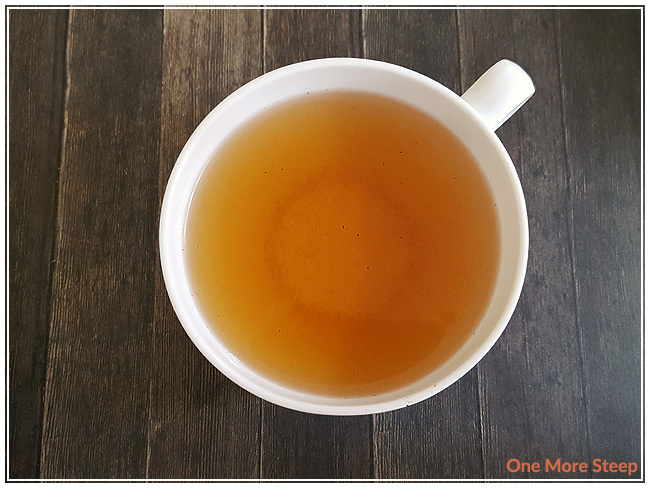 If I were to try this tea again (and that is a very big if), I would probably add more tea to steep, in hopes of getting more flavour, but it isn’t a very promising tea at all. I wouldn’t recommend S’mores Oolong.